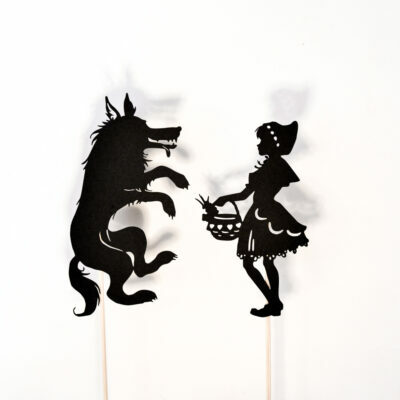 Bring the magic of shadow puppet theatre into your playroom! 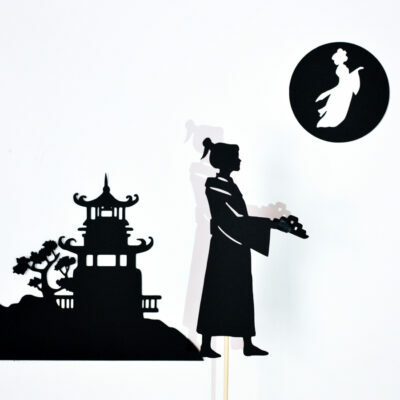 Shadow puppet theatre is an elegant yet very simple form of dramatic entertainment. Little setup is required, and that makes it perfect for busy life with kids. A flashlight is enough for a relaxed shadow play before bedtime. 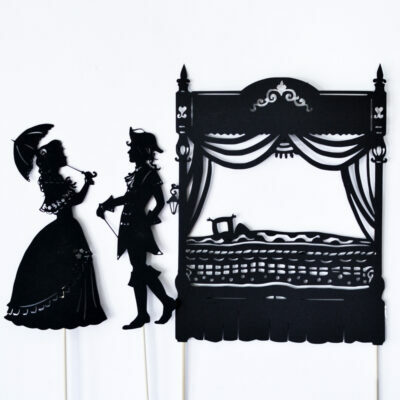 Add a simple cardboard puppet theatre or invest time into building a sturdy vintage-inspired theatre from wood, and you can run spectacular performances at home for friends and family. 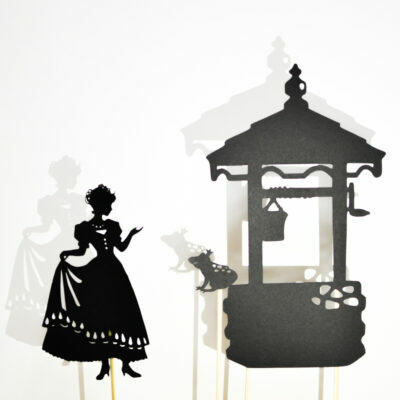 Shadow puppetry is arguably the oldest form of puppet theatre. 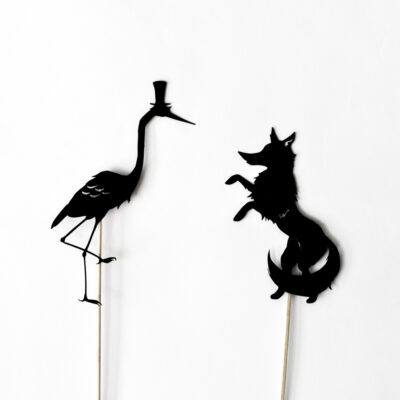 Shadow puppets had been know in China, India, Indonesia and other countries for a long time before coming to Europe. 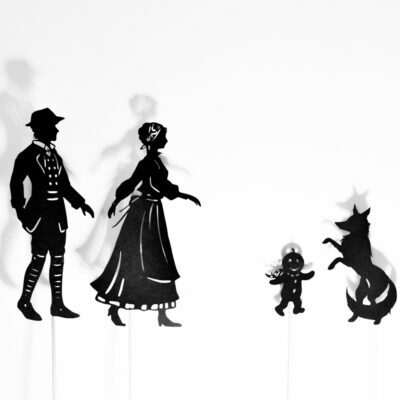 In the 18th century, shadow puppets became popular among the Parisian audience, spreading to the rest of Europe and North America over the subsequent centuries. 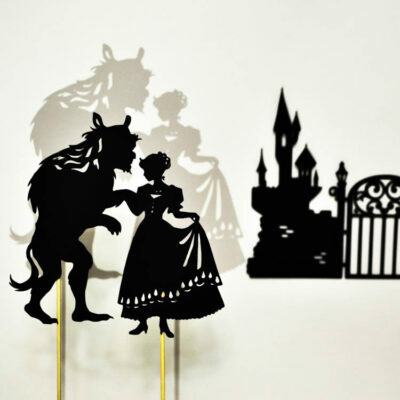 Nowadays, shadow puppetry remains pertinent – it is experiencing a resurgence in the educational environment and animation, thanks to the relative ease of production. 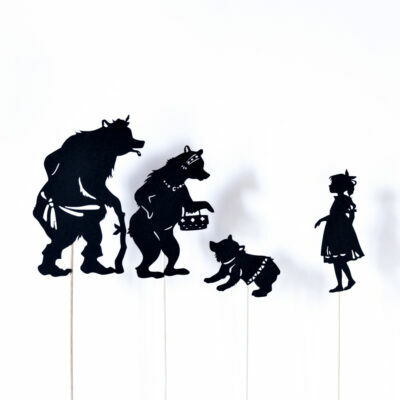 Shadow puppets make children’s experience with stories personal and engaging, as the characters become alive behind the screen. 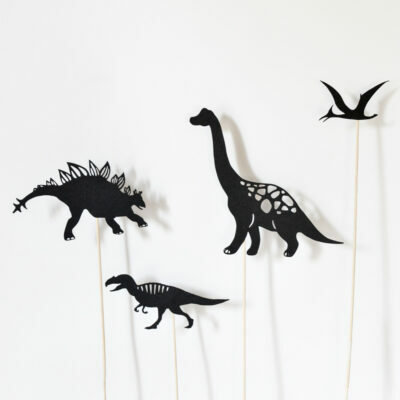 Children will want to return to them again and again, savouring their favourite moments! One cannot have a play without remembering the script. 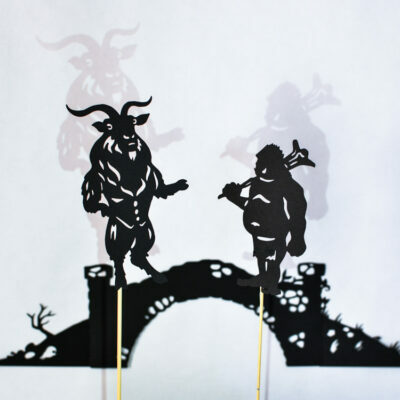 Shadow puppets will act as a playful encouragement for children to memorize the key events and phrases of the stories, then retell them out loud with puppets. 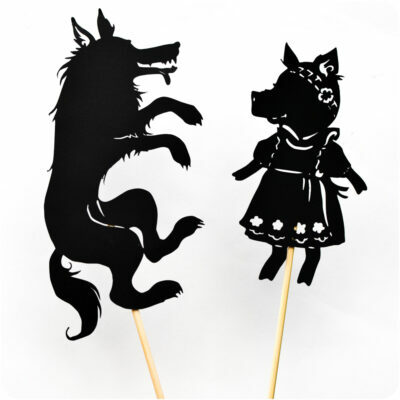 Shadow puppets are even more entertaining without a script as children come up with their own versions of familiar fairy-tales! 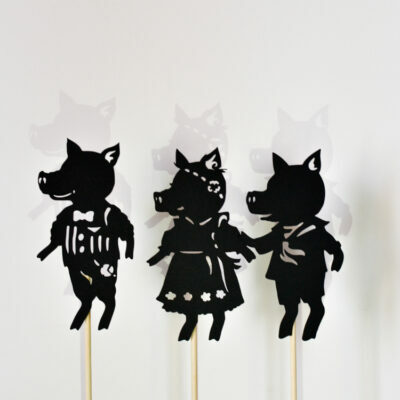 What happened after the three little pigs chased the wolf away? Maybe he got sorry, brought them a gift, and they became friends. Some of our sets are not based on any particular stories – an open invitation to create the wildest fantasies! Dramatic skills that come from performing in front of family and friends are only the tip of the iceberg. 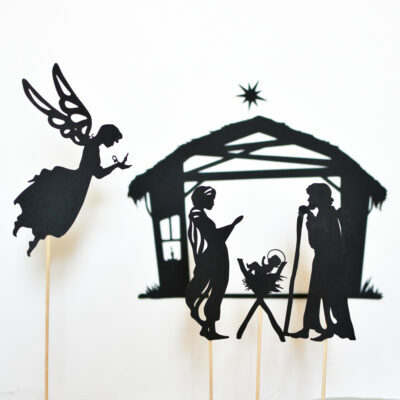 Getting into the theatrical spirit, children can build decorations, write scripts, design posters and score musical arrangements. They can learn about special effects and engineer lighting. 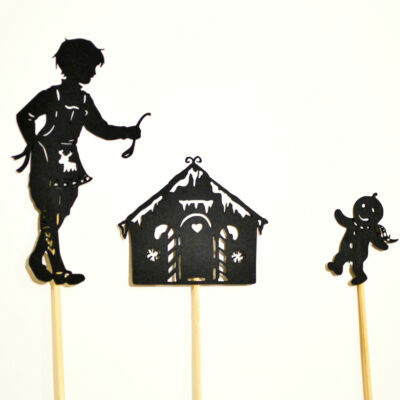 Relax in the comfort of bed as the shadows glide across the walls and lull children into a dreamland – or prepare a larger-than-life show and perform in front of relatives and friends! 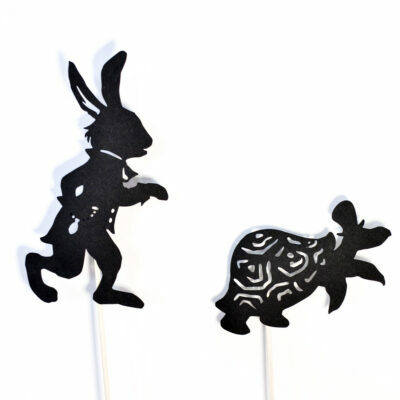 Either way, playing with shadow puppets can be a special way for parents and grandparents to connect with children. 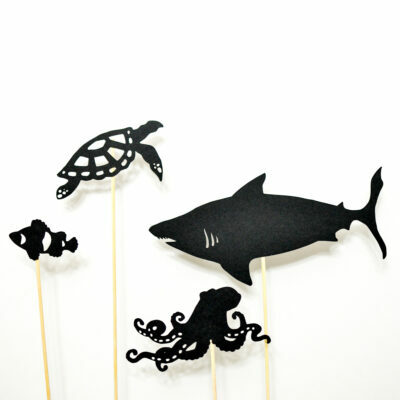 From babies to preteens, shadow puppets can entertain a variety of ages. The toddlers will listen to the story, while preschoolers will participate, and older kids can stage the whole show by themselves. Even babies can be entertained by the high-contrast images and the light play! 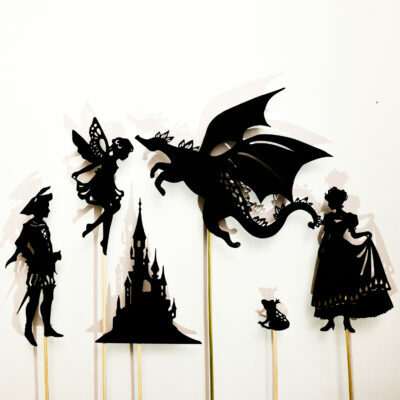 Our kids and their friends have been enjoying shadow plays since they were babies, so we have designed many sets based on fairy-tales. Now that they like to create their own stories, we are adding sets that have generic characters to let their imagination run wild. 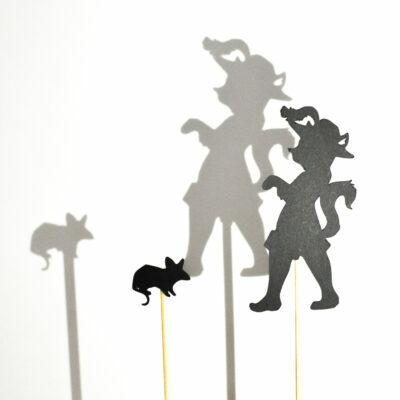 If you have an idea for a shadow set that we haven’t yet made but your kids would like, message us. 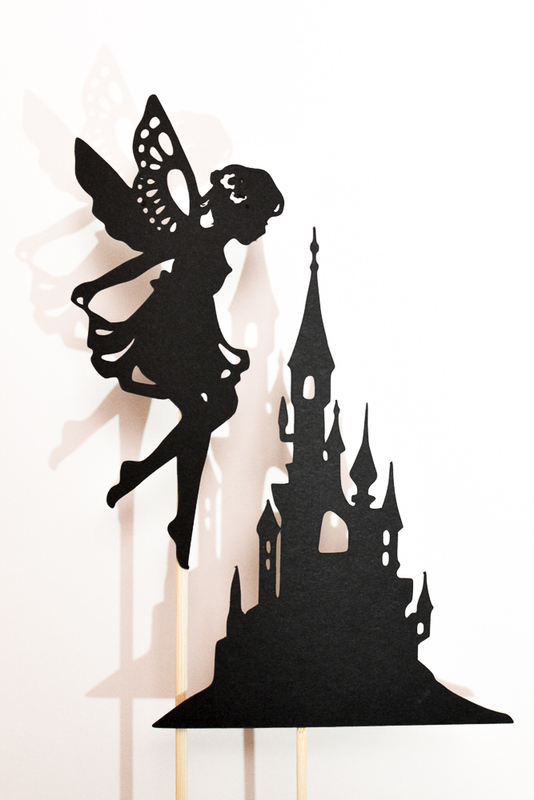 We’d be happy to bring their favourite stories to life!